The world's bullion investors and collectors are preparing for the launch of the brand new 1 oz Kookaburra Silver 2017 coin on 14th November 2016. This notable silver coin series was first launched by Australia's prestigious Perth Mint in 1990 and the 2017 edition is certain to be in high demand. As in previous years, one ounce coins will have a limited mintage, adding to their considerable appeal. Purchase silver Kookaburras from CoinInvest.com as a spectacular addition to your coin collection or as a smart investment that will certainly increase in value. 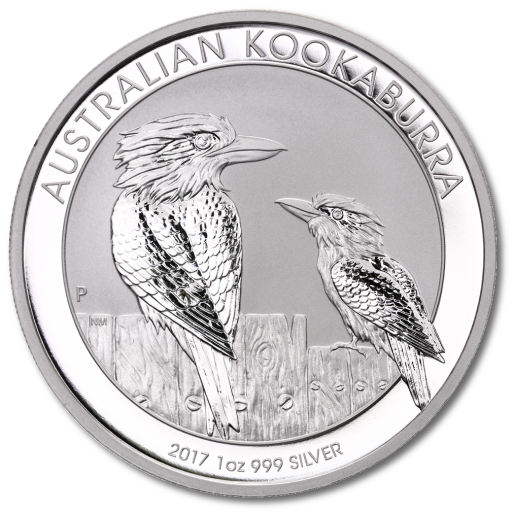 Each new 2017 1 oz Silver Kookaburra contains one troy ounce of .999 fine silver. They also feature an annually changing kookaburra design which increases their value as collectables in comparison with many other bullion coins. The obverse of the coin always features HM Queen Elizabeth II while the reverse shows the kookaburra, a native Australian bird that is a recognisable symbol of the country. CoinInvest.com is pleased to present the 2017 1 oz Silver Kookaburra following its realease on 14th November 2016. This brand new 2017 coin is supplied by the mint in a sealed plastic capsule and we aim to ship all orders as quickly as possible.